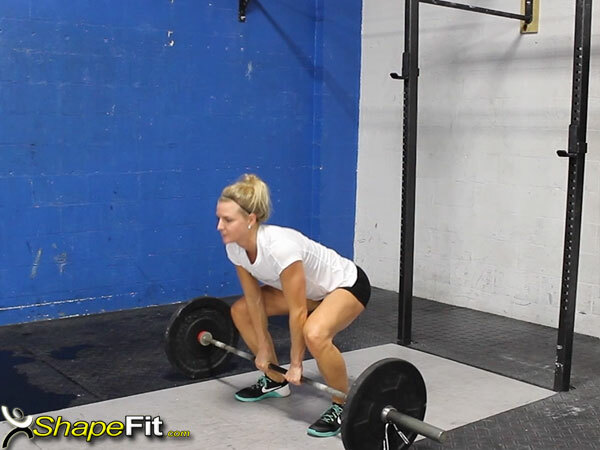 Muscles Targeted: The sumo deadlift high pull is a foundational CrossFit movement that is very effective at building muscle and increasing strength. This is a compound multi-joint exercise, which means multiple muscle groups are engaged when performing it. The back and hamstring muscles provide the initial drive by enabling you to hoist the barbell upwards. Assisting the back and hamstrings in this action are the gluteus maximus and the core muscles consisting of the abdominals and lower back. The deltoid muscles of the shoulders along with the upper trapezius and the biceps are all involved in lifting up the barbell to the top position which looks very similar to an upright row. Finally, the erector spinae muscles, which refers to a group of three muscle columns located on the outer sides of the verterbrae, are used with this exercise. 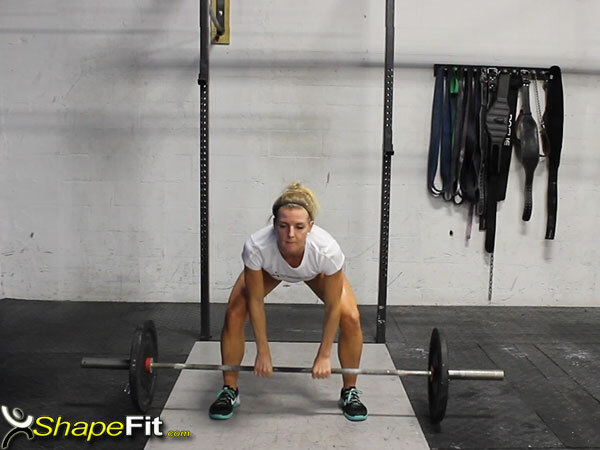 Exercise Instructions: The sumo deadlift high pull is performed in the following way. Begin with the barbell placed on the floor, not too far out from your shins. Assume a “sumo stance”, with your feet wide apart and use an overhand grip (meaning your palms are facing away from you), and place your hands in the middle of the barbell. Your hands should be fairly close together, with a width of about 3-5 inches between them. Step #1 – With your weight on your heels, lift the barbell and open your hips, ensuring that while you lift the barbell, your hips are extending fully before your shoulders continue the rest of the motion. Think about standing tall to help visualize the position you are attempting to reach. Step #2 – Once your hips are fully extended, you begin the shoulder shrug into an upright row. It is important to keep the arms straight throughout this entire movement (remember to keep them straight when you are extending your hips in the first part too). 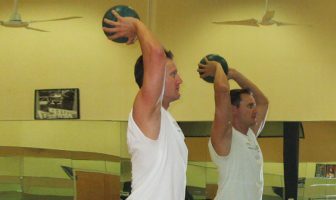 Transition from the shoulder shrug into the final upright row at the top of the movement. Try to bring the barbell up as close to your chin as possible. Step #3 – Having reached its highest point, slowly lower the barbell back down to the ground while keeping a firm grip on the barbell throughout the entire process. Don’t take too wide of a grip on the barbell since it will be more difficult to execute the upright row once you reach the top. Your grip should be narrow (hands placed about 3-5 inches apart). Don’t hunch your back or round your shoulders. Keep your back flat, chest out and your shoulders back. Don’t pause during the transition phase from the leg extension to the upright row. This is a continuous and fluid motion so the different phases needs to be executed simultaneously. When you are lowering the barbell to the ground, be sure to keep your back tight and straight so that you avoid rounding it which happens when you bend your back too far forwards which places too much pressure on your upper spine. Reps and Sets: Beginners should always start with a very light weight which usually consists of just the barbell (no added weight) in order to get the technique down before moving to heavier weights. In terms of the number of repetitions, start with 10-12 reps per set and do a total of 2-3 sets. 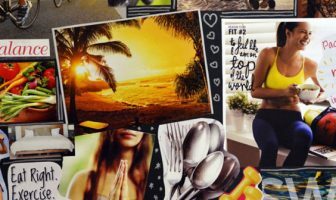 Gradually, you could increase the number of sets to 4-5 depending on your level of fitness. You can also gradually increase the difficulty of the exercise by adding more weight.